Answer: A signed advance reading copy (ARC) of THE MARK, my debut novel. Question: What will the lucky winner of the very first contest on THE MAN IN BLACK receive? That's right, I'm following in the footsteps of, oh, about a billion other authors and running a contest whose winner will receive a signed ARC of THE MARK. Only problem is, I'm too lazy to come up with an idea for a contest. So of course that will be the contest. Simply come up with the best idea for a contest, shoot it over to me, and you might win an ARC of THE MARK for your reading pleasure (or your selling on eBay pleasure). 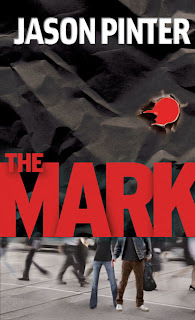 The reader who comes up the the best, the craziest, the funniest, the weirdest, wildest, most brilliant, most ludicrous contest will win a copy of THE MARK. There are no other limits, no other rules, check your inhibitions at the door. 1) The person who can kill the most polar bears while singing "Ave Maria" wins an ARC of THE MARK. 2) The first person to sleep with Burt Bacharach while constantly uttering catchphrases from "Austin Powers" wins a copy of THE MARK. Email your entries to jason@jasonpinter.com. You have until Friday, February 9th to submit an entry. On Monday, February 12th I'll post the best ones and pick the winner. I know there are some mighty creative (and insane) people out there, so let's see what you got. May the most demented mind win. The first person to be The Mark by running around Boston with a target on their back flipping off drivers wins an ARC of THE MARK. LOL! Sounds like a fantastic idea for a contest. I'm going to have to try and be creative and see if I can participate. The first person to interrupt a Toronto Maple Leafs game wearing nothing but a Russian flag and bunny slippers wins an ARC of THE MARK. Contestants will gather at the Port Authority station on the southbound platform. A copy of THE MARK will be placed on the corresponding platform at Penn Station. Contestants will drop to the track and attempt to outrun a Brooklyn-bound express train, jumping off at the Penn Station stop. Riding the outside of the train will be considered cheating. Bonus points for making it through to Penn Station on foot with at least two limbs still attached. An unsigned copy of the next JA Konrath book to anyone who makes it without touching the third rail.